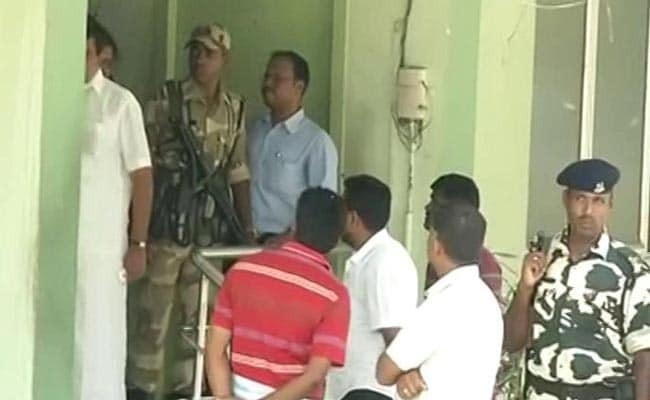 By-elections in Chennai's RK Nagar constituency -- to be held on April 12 -- may be cancelled, said sources in the Election Commission a day after cash for votes allegations surfaced. The decision, sources said, will be taken on Monday after the Chief Election Commission and other officials examine the reports sent by the state and Income Tax authorities. The Income Tax officials had alleged that the VK Sasikala faction of the ruling AIADMK paid Rs 89 crore to voters to buy support for its candidate TTV Dinakaran, who is also her nephew. As evidence, the department had cited documents seized during Friday's raids in more than 35 places -- including properties of the state health minister C Vijayabaskar. One key document recovered from the minister's house gives the alleged blueprint of the strategy to buy voters. The constituency is divided into 256 segments and the target was to reach out 85 per cent of the 2.6 lakh voters. Each voter was supposed to be paid Rs 4,000, indicating an outlay of Rs 89 crore. The by-elections in RK Nagar became necessary after the death of former Chief Minister J Jayalalithaa, who represented it for two terms. The faction of AIADMK led by the former Chief Minister's longtime live-in aide VK Sasikala faction is locked in battle for the prestigious constituency with the faction led by Jayalalithaa loyalist O Panneerselvam.